I think I have, on many occasions, described just why we go to the effort of putting on exhibitions. It is worth reminding and of course sometimes an exhibition (or two) come along which are that bit different. Service User artwork. These are the bread and butter of our practice in that they provide an outlet for the work created week in an out by our amazing service users and volunteers. The artwork is produced by people in or recovering from a very dark place and as such it ranges from the heart breaking and educating to the empowering and colourful. By having it on display it gives a massive boost in the self respect and confidence of the artist often being a catalyst to further recovery. Solo and group exhibitions. This is where one or two or three service users and volunteers who have produced enough work have a solo or joint exhibition. in a way this is a step on from the service user exhibitions where a person might have one or two artworks on show. This is a big step and often requires a lot of support but again is a massive boost to confidence and esteem as well as that further step on the path to recovery. Collaborations and projects. These are joint projects that help us in many ways. Some of it is awareness building, about the fact we exist or about a particular issues that effect our service users. These also make links with other organisations, artist and groups. It often brings in money as well with resources being funded for projects or room hire etc. Local artists. We have exhibitions, either solo or joint, by local artists. We give priority to people creating despite an illness or disability but this does not exclude any local artists. This again generates income through commission but also is of great value to our service users providing inspiration and ideas. So the exhibitions we hold or a vital part of what we do. It is therefore imperative that we get people to see these exhibitions. A harder call. Exhibition require a lot of effort to promote and get visitors in to. Advertising costs money but you can only do so much advertising on social media. It is noticeable that when you have a volunteer or exhibitor with the time to promote an exhibition wildly then the visitor numbers are higher. This is not always possible and sometimes it shows with poor attendance. Maybe if people realised the impact their attending an exhibition has people would be more willing to make the effort. Considering the effort that goes into putting exhibitions on, turning up is a comparatively minor effort. Putting the exhibitions on has enabled us to teach many volunteers and service users new skills. Mounting, framing, curating, hanging, promoting and running exhibitions. They may not go on to work in a gallery or become an artists but when they are recovered it’s a whole new set of skills that can by adapted to many new and different situations increasing employability or volunteering opportunities. So please don’t just flick past our adverts for exhibitions. Come along to them and support the vulnerable people who helped create it. You might just make the difference to some bodies life that enables them to recover that bit quicker. Warding off the downward spirals……. It has been a generally slow week at S2C. Although we did not take part in Torchlight (all our service users are very much not in a place that means they are well enough to parade through the streets) some of our volunteers were involved in other organisations efforts. We know well the frenzy of preparatory activity required for these events! However we are entering a bit of frenzied activity now with Comic Art Festival Windows and Casterton School Archive Exhibition to get ready. I thought I would put out a plea for some volunteer help in a very important and specific role at S2C. Twice a week now our volunteers head up to the Kentmere Ward at Westmorland General Hospital. This is to run a creative session on the ward with the inpatient. The ward is there for people who need monitoring who are in crisis, drug or alcohol rehabilitation, altering of medication and many other reasons why their mental health has put them in need of round the clock monitoring and support. As such it can be a bit daunting to walk in and start doing art but it is a very rewarding place to create with the people who are there to get help. The ward staff are very supportive and it is a safe environment to work in although one can feel intimidated when there are loud personalities of those who are in distress showing their pain. This is why we always work in pairs with two volunteers or when there is the ward OT present to be with the group. Why do we do these sessions? Some of you reading this may have been in a situation where you have needed to be on Kentmere Ward or a similar facility. I think those people will understand. It is the contact with the outside world. The distraction of having an activity which allows you to escape from your predicament and be free to express yourself without boundaries or requirement. It is seeing a friendly supportive face at regular times. It is about building the confidence to be with people and communicate again after a traumatic experience. It is about finding the small steps to self belief built through achieving something that, although it’s not a massively important achievement, begins to rebuild that self respect and belief that you can do something. The ward staff rally value these sessions as with current budgets they have limited resources to provide this kind of interaction. The sessions benefits extend beyond the ward too. When an individual leaves the ward it is very rarely the end of them needing support. It means that we have been introduced to them and they know we are a safe place to come and continue to occupy their time as they continue to recover. They can attend sessions at S2C then with some recognisable faces where they can continue that journey of recovery and rebuilding of self confidence and respect. It is a fairly simple arrangement but it needs volunteers who are willing to go on to the ward. We work in pairs so we like to have a least one “arty” person supported by another who does not need to be. You go onto the ward, set up, and people on the ward join in with no pressure to if they don’t feel up to it. You create, you talk, you listen and we hopefully bring in some laughter too. Then you help tidy up and head off. The “arty” volunteer is the one who thinks up the sessions which we keep fairly simple and being mindful of using items that could be used to self harm. Mondays 10-12 and Wednesdays 2-4. If you think you could help in these sessions then drop us an email to info@space2create.co.uk or message us via Facebook or the comments or use the contact form on our website. You might just help somebody make a big small step to their recovery. It is always good to be involved in festival in the local area. Not least because it gives us a chance to engage with a whole new audience who might otherwise never hear of us. This weekends Lakes Alive events have been no different. The first day (yesterday) Saturday was a very busy day with one of the highest numbers of people through our unit in one day we have ever had. What makes doing these worthwhile are three things for me. Firstly that you do indeed get to meet a whole new set of people who will say things like “We never heard of you before”. What is really important in this though is the handful among those crowds who will come and say “My mum, friend, partner, son, daughter is really isolated and struggling, this could be just what they need”. Also on the other side of the “never heard of you before” coin are the volunteers. People with an interest in creative activity who see the work we do and want to help out. This is exactly what we need to help us run sessions and support people as well as we can. We had a few conversations yesterday that may result in new volunteers and service users. Secondly it is the opportunity to catch up with people who have been to S2C or helped in the past. I had a few moments yesterday where a past service user was looking round and we were able to chat and hear how they were getting on. It is always rewarding to see people you have helped now getting on with their lives and flourishing in ways that you might never have expected. One of those “makes it all worth while” kind of things. Finally it is raising awareness. A lot of people are interested in the arts and some of those know what they are looking at where some are less understanding of the work we do. Overwhelmingly in the people who came through yesterday there was very positive feedback. Positive about the work we do, positive about how effective a tool creative activity can be and also positive about the quality of the artwork being produced. I think over the last decade in the general population there has been an increasing awareness that art is not playing about and that we are very serious about what we do. So this morning as I write this I am shattered but also very positive about the festival so far and looking forward to seeing what new opportunities, people and old friends the day will bring. This last week has seen a number of interesting collaborations develop around S2C. It is often a daunting to be faced with a large task but when the task can be shared it makes it a lot easier and even more rewarding as you develop links and new connections either at an organisational level or a personal one. Over the last week our groups have been involved in three group artworks. The benefits of working on something as a group are many not least because the service users we have are often, literally, afraid to create. A group work offers the chance to feed off others creativity and have the anonymity amongst a group so that you don’t feel exposed. It also means that large creations can be achieved giving an overall sense of achievement but each individual feels a very personal sense of achievement having created their smaller chunk. This also translates up the scale. When we can collaborate in a larger project with other organisations it also allows S2C to achieve more than it might be capable of alone. This week we had Manna House pay us a visit for a session. It’s great that we can use the skills we have to help another organisation support it’s service users with an activity they might otherwise not get an opportunity to enjoy. In these difficult times more and more charities and groups supporting vulnerable people are being forced to explore ways to collaborate. As cuts increase and funding reduces there is no room for being insular. Increasingly the third sector needs to come together where appropriate to achieve its goals. In collaborating effectively it offers the opportunity to achieve far more for the local community than you might ever do so acting alone. At Space2Create we work with many organisations in supporting them and being supported by them. From statutory bodies, NHS, Councils, funders, charities, groups and individuals it is only right that there is a two way transfer of benefits from working together to achieve our aims. 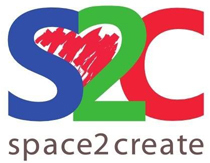 Space2Create has always looked to do more and help more people. Sometimes the future looks very bleak and you wonder how to keep things going but there are always people around who can help you see a way forward. Sometimes progress involves risk. Calculated risk where you look at an exciting possibility but are unsure it will work. There is no harm in exploring possibilities. An organisation like S2C that ignored possibilities and simply kept plugging away in the same fashion would be doing a disservice to those it supports. If we had taken that approach we would not exist and would have disappeared along with the charity we originated from nearly five years ago. So the future is difficult. But there are opportunities to be better and do more in collaboration with other like minded organisations. We will always look to achieve more. Who knows what might happen next?